Though I do not really buy too many CDs these days, I always give a pass to anything released in Japan, where CD is still king. 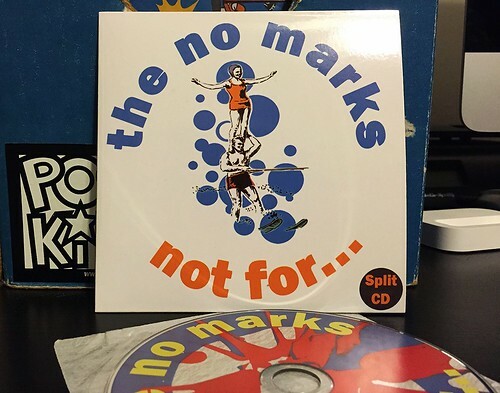 This CD wasn't something that I thought I urgently needed to add to my pile of records, but I do want to have a complete No Marks collection. Maybe not every variant, but certainly every release. For the No Marks part of this split, it's the 4 songs that were already released on vinyl through 2 split 7"s. The songs are every bit as fantastic as they were when I originally wrote about them, but as a quick refresher, they're absolutely stellar melodic punk rock. File them under 90's influenced UK pop punk. They're truly one of my favorite bands at the moment. Not For... did provide something new on this CD and their three songs are played in the key of Snuffy Smiles. Being from Japan surely has something to do with it, but these guys would fit right in on a Snuffy Smiles 7". They're big on anthemic choruses with gruff vocals and they particularly remind me of a mix between The Urchin and Cradle To Grave. Chances are, if you like any of the Japanese pop punk that I write about on this website, there's a pretty good likelihood that Not For... will be right up your alley.